Choices seem to be everywhere—choices about what to do after high school. Where to go? What to major in? Now add to that yet another choice to be made: How to send your standardized test scores to put your best foot forward? It used to be you sat for the SAT or ACT and chose which schools would receive your score (notice the singular). But now, with students taking either or both of the tests multiple times, there are new options for presenting your highest scores to the colleges of your choice, such as SAT Score Choice. You should familiarize yourself with the options and some of the situations in which you might use them. However, it is important to note that each college has its own score-use practices, and many colleges and universities do not utilize Score Choice or superscoring. These schools generally want you to submit all of your test scores, and they will consider the highest scores received. It is important that you check with your college choices to see what they require. SAT Score Choice: This is available for the SAT and the SAT Subject Tests and allows students to choose which scores they send to a particular college, by date for the SAT and by individual test for the SAT Subject Tests. For example, if you take the SAT in January and again in April, and score better overall in April, you can choose to send just the April results. For the subject tests you simply pick the best test result and send that. There is no extra cost for this service. Superscoring: While many schools long have superscored the SAT, taking the best scores for each section (math, critical reading, and writing) from multiple test sittings, more colleges and universities are starting to do so for the ACT sections (English, mathematics, reading, and science) as well. You can check with the admissions office to see if the colleges you are interested in use superscoring. However, not all the score choices are up to you. 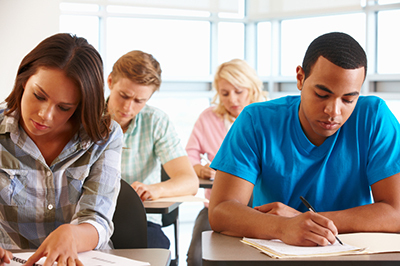 Universities and colleges can decide what ACT composite score they will consider; for example, they can choose the “most recent” score, the "single highest" score in one sitting, or the "combined highest" (superscoring) approach. The key is making sure the selected institution has all of the information required, and that it is generally better to err on the side of providing too much information as opposed to too little. By providing multiple test results, students assure that their very best scores are available to be considered, and colleges generally are interested in weighing the highest scores.